I’ve found a site for those who like the concept of “pocket shot” but either can’t find the product or like to stick with their name brand liquor. The site is www.disposableflasks.com. 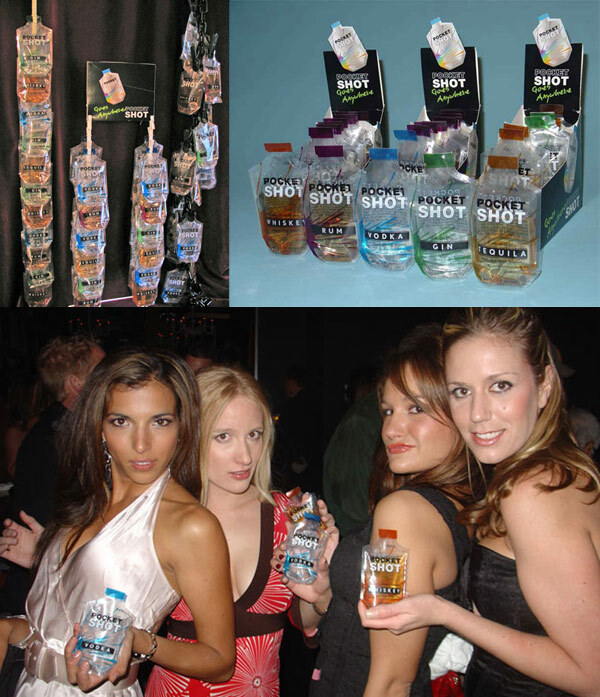 They have disposable flasks that hold 5 shots and are collapsible. I received the camouflage design at Mardi Gras this year and used it a few times before throwing it away. They have other designs available on their website. The site is not the fanciest but it works. The reason I liked the flask was I didn’t worry if I lost it or if it was taken from me since it was not my nice steel flask. I’m a big tailgater and concert goer an like to drink the nicer stuff so I just assume bring my own and save a few bucks. Nothing can beat going to a bar and ordering a nice drink, but if your going to flask it and do not want to worry about your nice flask, here is a good option. Rubbish. What better way to enjoy a night on the town that imbibing a smuggled Capri-Sun full of warm Tequila? It’s easy; simply tear, spill and lick from floor. If you can’t stand watching a show without a stiff one, just go somewhere else. It’s really not hard to find a bar with grown-ups. At least a flask provides a bit of insulation - and class. The bar-fly shot above looks like a screen shot from a bad SNL skit. Waste of money. I’d rather just use a flask. I think the concept is great, a pretty neat idea for sneaking in alcohol somewhere, but the packaging is quite horrendous. It really could be so much better with better packaging. At a quick glance, I don’t really think of alcohol…rather sunscreen or something else. The only connection to alcohol is the fat helvetica, which actually makes me think of listerine or pocket paks ? ?, but then you see the distinct alcohol name on the bottom. I agree about the packaging concept and it’s potential. But the lack of reputable alcohol brands and the somewhat lackluster graphic design, makes me think it’s a bit inferior to the existing shot bottles available from major producers. What is the price point on these pocket shots? Perhaps if too low, they won’t get cred for quality perception. Either way, I would rather have a premium brand I trust. Ummm, actually, they look like big bottles of lube. You go ladies! hmmm it looks like the bag where urine is placed don’t you think? Gorgeous packaging and very great idea. Now ladies won’t be able to ruin my clothing when they throw their drinks at me.